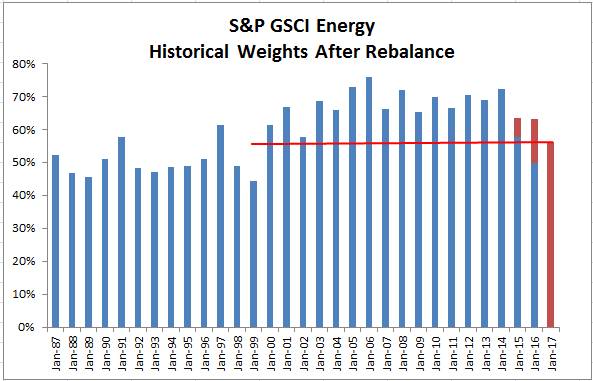 The S&P GSCI annual rebalancing is beginning today to adjust the commodity weights to their 2017 target weights over the next five days. Energy remains the biggest sector in the index in 2017, targeting 56.2%, despite a significant decrease from its 2016 target weight of 63.1% and ending weight on Jan, 6. 2017 of 62.2%. In fact, it is the lowest target weight for energy since 1999, driving $600 million of energy outflows for every $10 billion tracked. Source: S&P Dow Jones Indices. Red bars show target weights and blue bars show actual weights. Note in 2015 and 2016, the market was falling during the rebalance, so the actual weights never reached the target at the end of the rebalance period. One way to look at the results is simply by the weight (Reference Percentage Dollar Weight found on page 11 of the methodology) but most traders want to know how much money is moving as a result of the rebalance to the new target weights. 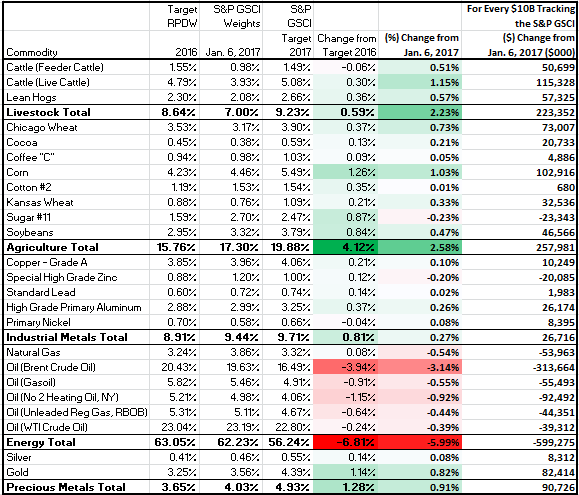 While the table below shows the dollars that will move for every commodity from the rebalance for every $10 billion tracking the S&P GSCI, the biggest shift is away from brent crude with an estimated $313.7 million flowing out by the end of the rebalance. It is 8 times bigger than the $39.3 million of outflows WTI will experience from the rebalance. The main reason this is the case is because the volume of brent only increased 8.9% versus the WTI volume increase of 26.9%. Also, the average contract reference price fell 32.5% from $65.8 to $44.4 for Brent, versus the lesser WTI drop of $59.4 to $42.1 or 29.0%. Note all the sectors will absorb the dollars exiting energy with the biggest inflow of $258 million for every $10 billion tracking the S&P GSCI going to agriculture. For information on total AUM tracking commodity indices, please view our replay of the S&P Dow Jones 10th Annual Commodities Seminar and specifically watch Keynote Address: Where in Commodities is the Smart Money Flowing?